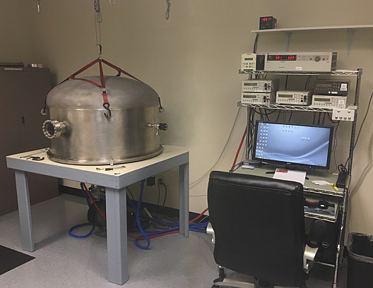 Technology Applications, Inc. provides a wide range of strap testing services for our clients, both in-house, and with our test facility partners in Boulder, CO, and Southern California. From thermal conductance testing, to thermal cycling, stiffness, tensile strength, shock and vibration testing, our trained staff and test facility partners have the tools and experience required to test your straps to nearly any spec. While some testing is complimentary and included in certain orders, other tests can be added to your program for reasonable rates, if desired. Our sister organization, TAI, Inc. (www.tai-inc.us) also will begin providing some thermal strap testing services for Technology Applications, Inc., in addition to their thermal strap R&D and Government Contracting work. To learn more about the testing and qualification services offered, see below, and please feel free to call us at any time. 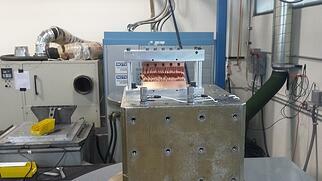 Thermal conductance testing is provided on site at TAI. TAI's highly trained thermal strap technicians perform thermal testing on all of our strap products in our custom built vacuum chambers. Our main chamber (pictured on the right), has a 36" diameter, and an interior height of 24". 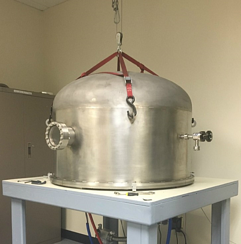 While we currently only test at room temperature (~295K), TAI is designing modifications to our main chamber, in order to test thermal conductance down at 77K, and we are developing the capabilities to test down to liquid helium temperatures. Thermal testing is included in GFTS programs, and one free thermal test is included in any CuTS custom or standard order (additional strap tests are provided at an affordable rate). TAI provides in-house thermal cycling of all of our thermal strap products. We have the capability to perform cycling down to 77K, and up to (in excess) of 475K. Contact us to discuss your specific requirements. More information on our Thermal Cycling Test Services will be coming shorty. To discuss your specific testing needs, contact TAI today. In-house stiffness testing is available for all of our CuTS and GFTS products for a small additional fee. With all stiffness tests, unique tooling is designed and used to test the strap’s stiffness in any desired position for all axes. Any positive or negative displacement relative to the strap’s neutral position can be measured, and the force and displacement is measured using NIST traceable calibrated transducers. 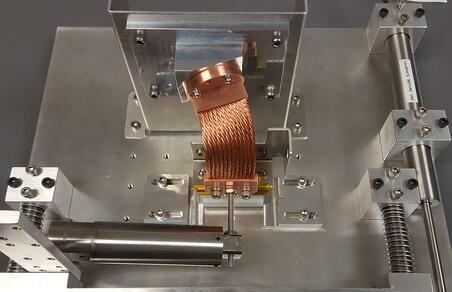 To learn more about our stiffness testing services, and for sample stiffness test data on previous copper and graphite thermal straps, please contact us today. Pictured (above): custom copper flight strap (METEOSAT) undergoing stiffness testing at TAI (April 2016). TAI offers shock and vibration testing for your program for an affordable rate. Please plan for an additional 1-3 weeks depending on your spec. Space qualification / shock and vibe heritage data is available to aerospace clients upon request. Pictured (left): custom copper flight strap (NASA GRACE) undergoing vibration testing. To learn more about our thermal strap offerings, or if you have an inquiry about a current or future program, contact us at any time. Our Marketing and Sales Department is available 7 days/week, from 06:00-22:00 MST (13:00-05:00 GMT).